I do some of my best thinking (such as it is) or memorising while I’m walking. Unless I’m asleep or on stage, motion is very comforting for me; tapping feet, waving arms, walking, running. I even fall asleep on planes or in cars over long distances. I like the idea of movement, and was drawn to capoeira the Afro-Brazilian dance martial arts for that very reason some years ago (I’ve fallen off the wagon but intend to get off the bench sooner rather than later). In fact I’m hoping to make it to Brazil for one reason or another this year but before that I head to London this June where two of my interests are converging in the most delightful way, in a kind of abstract sports meets literature romance. As part of the London 2012 cultural Olympiad the Southbank Center is hosting an estimated 200 poets in a series of events that have been collectively named Poetry Parnassus ; a non-competitive gathering of primarily poets and some storytellers, rappers and singers. As the poet from Botswana, I’m honoured to be participating in what is expected to be a really big literary party :) and am truly excited about the whole initiative. 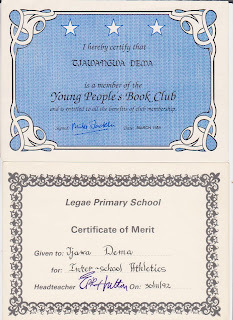 When I was about five years old my parents signed me up to the Young People’s Book Club and each month I got a lovely package – a whole envelope with my name on it and tons of books for me to put stickers in and colour and later read. A couple of years later in primary school I got picked for the junior running team for the first time and these two childhood hobbies stuck with me in one way or another over the years. 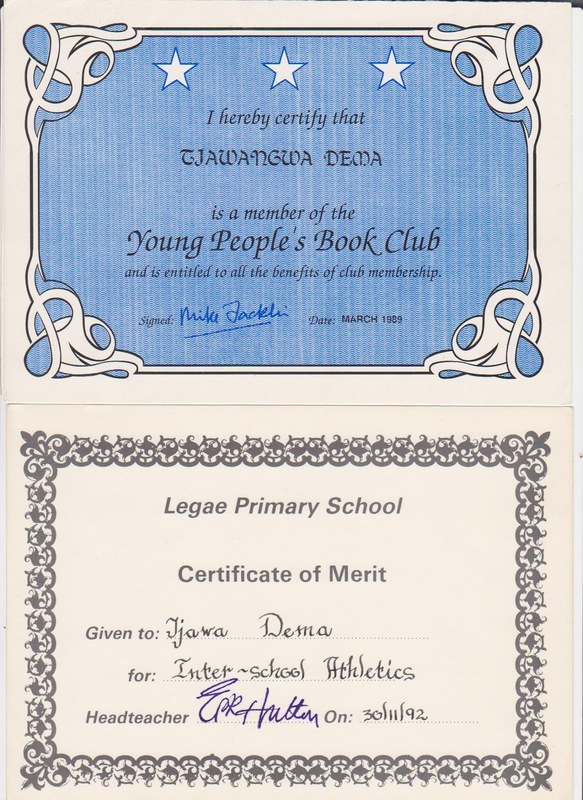 Way back when, my mother thought my commitment to athletics was ‘boyish’ but on the other hand she has kept every sports certificate I ever got perfectly safe, some for over twenty years. Apparently I’m now old enough to be trusted to keep this paraphernalia myself. I haven’t run competitively for over a decade, a ‘sudden’ onset of mitral valve prolapse (MVP) and Supraventricular tachycardia(SVT) put paid to that bit of budding sportsmanship. In my case neither one of those conditions is life threatening and I certainly didn’t have to give up sports, quite the contrary but back then Botswana didn’t as far as I know have a heart specialist or support centers like the Heart Foundation, so for years I lived with some seemingly adrenaline-induced discomfort and repeated diagnosis of psychosomatic pain – the GPs way of telling your parents that you are imagining the breath-halting fist clenched around your heart and so I just stopped running around. Now I have a fantastic cardiologist with the most beautiful bedside manner and access to really cool machines. Still all these years later whenever the Olympics or the Commonwealth Games come around my eye is always on the track. By no stretch of the imagination was I destined for athletic greatness, I simply enjoyed sprinting and cross-country runs enough to commit to Mr Grihault, and later Mr Walk’s sometimes grueling training regimens in preparation for the national inter-school games. Botswana has unfortunately never won a medal at the Olympics but this year, I’ll be in London rooting for Botswana’s 400m world champion Amantle Montsho who picked up gold at the 2010 Commonwealth Games… looking for just a little bit of storybook magic. Enjoy London! Let me know when you get back and we can do something in the column. Thank you Lauri, on both counts. I'll be in touch.